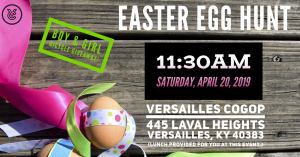 Join us for an Easter Egg Hunt at Versailles Church of God prophecy. Register at: vbspro.event/p/VCEasteregghunt2019 by April 13th! Be sure to arrive around 11:30 a.m. as we will have some instructions for our hunt that will promptly start at 12:00 p.m. Lunch will be provided, come hungry! We will be giving away boy and girl bicycles, so be sure to stay after the hunt. **Printed registration forms available at the church. Call (859) 214-4662 if you need more information.